Currently, all photovoltaic solar cells work in basically the same way. There’s a wafer of semiconducting material (usually silicon) sandwiched between two electrodes. When light (photons) hits the semiconductor, it creates an exciton — essentially a free electron (i.e. electricity). Currently, the Shockley-Queisser limit states that a single photon can only create a singlet (single) exciton, with any extra energy dissipated as heat. Without getting into the physics of it, this results in a max efficiency of just 33%. 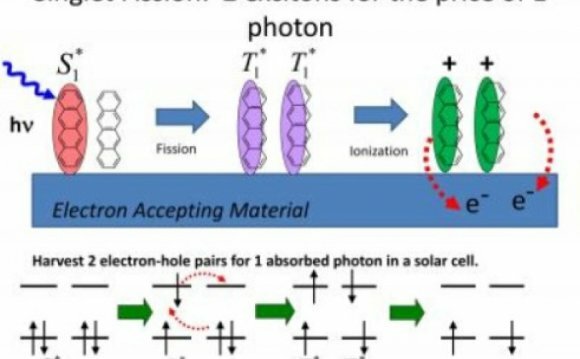 Now, however, four chemists at UCR have found a way of turning a single photon into two excitons, by a process known as singlet fission. As the name implies, singlet fission is a process by which a single exciton splits into two triplet excitons. (I’m not sure why they’re called triplets, because there’s only two of them, but I’m not going to argue with four guys who have a lot more letters after their names than me.) The researchers don’t yet understand the exact mechanism for singlet fission, but it seems to occur more readily in semiconductors with multiple, spaced-out bandgaps.